Regular brushing and flossing at home is important, but is only part of a successful dental routine. You need a professional dental teeth cleaning at least twice a year to remove tartar and plaque buildup. Combining regular brushing and flossing with at least bi-annual dental exams and teeth cleaning will help protect you from tooth decay, tooth loss and gum disease. Removal of Tartar: Tartar is made up of hardened plaque that’s accumulated on the surface of the tooth. Tartar can even be found below the gum line, which can lead to the development of gum disease. Brushing alone won’t remove tartar; it takes specialized dental tools and a knowledgeable dentist and hygienist to remove tartar build-up from the surface of teeth. Removal of Plaque: Plaque is comprised of saliva and bacteria from food that hasn’t been removed. Plaque can be removed via vigilant oral hygiene, in addition to regular visits to the dentist. If plaque is not removed, the build-up can development into tartar, inflame gums, and lead to gum disease. Teeth polishing: No teeth cleaning session is complete without teeth polishing, where Dr. Kidess and her team gently removes surface stains to reveal a brighter, cleaner smile. At our office, Dr. Kidess and her team have years of experience performing gentle yet effective teeth cleaning services. Dr. Kidess will demonstrate how you can keep your smile healthy and bright with easy-to-use oral hygiene techniques. 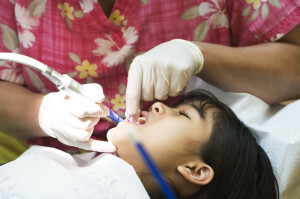 She can even show young patients how to properly brush, floss, and use fluoride. With regular check-ups every patient will enjoy better dental health for life. To schedule a consultation with Dr. Kidess or to learn more about our teeth cleaning services, contact our dental office at (480) 991-2290.